Agents of Mayhem is a B-movie in video game form. The sooner you accept that, the more fun you’ll eventually have with it - and there is plenty of entertainment to be blasted through here. A kinda continuation of the Saints Row franchise (it takes place after Gat out of Hell’s retcon ending), with a healthy respect for games like Crackdown and GTA, Agents of Mayhem never tries to be a serious, AAA game. It lightly pokes fun at genre tropes - gruff heroes, sinister bad guys, super-powers - while underpinning them with a thoroughly playable, if rough, base experience. In other words: if you don’t hold this up to the same standards as GTA, Horizon: Zero Dawn, and any other blockbuster you care to mention… there’s loads to love. Even the dialogue and plot seems to acknowledge the fact that Agents exists to let players mess out and cause havoc, without worrying too much about whether or not the game is a work of art or fascinating story. There’s a vague plot about an evil guy with a pointy beard, called Dr Babylon, and his strange work with dark matter. The tutorial sees me taking control of the starting three characters, with each one tackling a brief section of the same mission. Even they admit that players here are just here for the shooting, so the very first thing I do is empty an assault rifle clip into a door to open it, before listening to radio chatter about my on-screen hero being confused by a giant glowing ball of energy. It’s a clever reflection of what the player is probably thinking too, and the game takes roughly two minutes to get me to a place where everything in the room is exploding and dying in a shower of sparks, flames, and glowing collectables. That’s what you came here for, right? So, who do you get to cause mayhem with? There’s Hollywood, a preening movie star type who wields an assault rifle / grenade launcher combo; Hardtack, a burly shotgun guy with an aggressive outlook on life; and Fortune, an angry woman with dual-SMGs and a drone who delights in stunning enemies. Totally different character stereotypes, yet they feel largely the same to play as at the start. When upgrades are unlocked - and my goodness, my hour of hands-on is a constant bombardment of new stuff - then these three start to feel different, their specialisms providing me with increasingly fresh options in combat. It’s worth noting that you can switch between them at any time, by tapping left or right on the d-pad, and there will be 12 Agents in the final game. Each is gloriously over the top and amusing in their own goofy way. As for the actual combat… it’s not the tightest third-person shooting you’ll ever play. Next to the likes of Gears and Horizon, it feels very imprecise and cartoonish. But making stuff blow up is easy enough, and in my brief time with the game I definitely get involved in a bunch of battles that create absolute carnage across the open-world this game is set in (a futuristic version of Seoul, South Korea). Mercifully, basic ammo is unlimited, so you can just shoot anything that moves. And yes, you can blast random pedestrians and blow up their cars - I checked, several times. There’s driving too, if you fancy climbing behind the wheel, and it’s about as precise as the combat. The point, however, is to torch the vehicles rather than taking them for a spin. I’m treated to a whistlestop tour of the game’s functions during this first hour. There’s a hub area where the Agents can do all their upgrading and chat to secondary characters, called the Ark. While I’m there I have one of the techies create a weapon that fires massive metal boulders at my foes, called a Gutterball Gun. Back in the city, I cackle as it indiscriminately mows down baddos and terrified commuters who happen to get caught in the crossfire. Hey, this is Agents of Mayhem, not Agents of Mild Unrest. I’m also pointed towards various main and sub-missions during my time in the Ark, so it’s a neat way of keeping all your activities contained before you head into the open-world to complete them. As you’d expect, there are heaps of collectables to snag, upgrade trees galore, and loads of secrets tucked away in both the game world itself and the menus. So much busy work here. Cut-scenes are very stylishly rendered as anime shorts, and the whole game is pleasingly chunky and colourful. No, it won’t stun you with the quality of its visuals, or wow with the slickness of its shooting, nor will the plot win any beard-stroking writer’s awards. 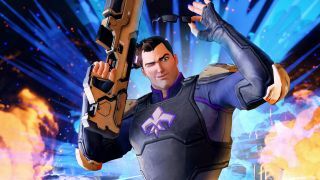 Accept that Agents of Mayhem exists as a sandbox for you to smash up a city, free from the pressures of having to give a damn, and this could be a welcome, entertaining distraction when it releases on 18 August. This demo was played on PS4.